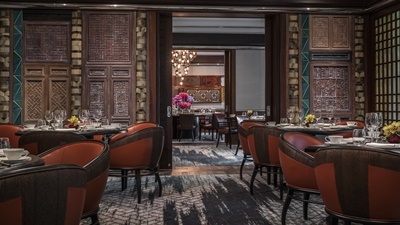 The award-winning fine-dining restaurant Jiang-Nan Chun has reopened its doors at Four Seasons Hotel Singapore after its months-long revitalisation, bringing together the exquisiteness of chef-crafted Chinese cuisine with the magnificent storytelling of the Jiang-Nan region throughout its new interiors. The new concept is based on xiang le zhu yi (享乐主义) – “the principle of enjoyment and happiness,” which heralds self-actualisation embodied in the pursuit of culinary pleasures personally handcrafted by the chefs. How one eats and why one eats are just as important as what one eats. 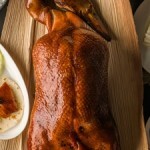 Jiang-Nan Chun is one of the rare places in Singapore to taste succulent meats fired in wood and charcoal ovens, with its new specially-customised duck oven where not just duck meat, but also selected dishes of dim sum and claypots are prepared by Chinese Executive Chef Alan Chan and his team. The revitalised menu also includes classic signature dishes and new favourites. Favoured by many dignitaries and VIPs for its exquisite dim sums, meats and famous double-boiled soups that nourish the skin and body, authentic Chinese cuisine is innovated with nuanced flavours that tease the tastebuds, and the freshest traditional ingredients are used to elevate the taste and aroma. Every dish is handcrafted, while gourmet dishes and secret recipes create a sensorial experience for guests. Xiang le (享乐) cuisine is characterised by wellness benefits, special cooking methods, seasonal ingredients and an element of surprise to discover in every dish, while xiang le drinks are elevated with curated tea lists and wine menus (including a partnership with Riedel, and a Wine by the Glass program using the Coravin system), as well as a series of eight exclusive cocktails (including specially-crafted tea-infused cocktails) only available at Jiang-Nan Chun. The xiang le environment is in the subtle, ambient storytelling through its furnishings and music, while the xiang le world-class service is interactive, knowledgeable and intuitive. With intimate attention to even the finest details in cuisine, service and ambiance, guests are immersed in a holistic xiang le paradise experience at Jiang-Nan Chun.